Every hotel that wants to hold on to and grow its direct bookings is going to need a booking engine. A booking engine enables a hotel to accept direct bookings online through its official website. And as travelers increasingly book their hotels online, having a booking engine will make all the difference between staying competitive and giving up a growing amount of direct business. Not just any old booking engine will do, however. A main reason why OTAs have been so successful at capturing online bookings is that their booking pages are optimized for converting users. To compete with the OTAs, then, hotels will need to use equally optimized booking-engine technology. So we’ll say it again. Every hotel that wants direct bookings needs a booking engine. And every competitive hotel booking engine will be optimized for conversion by facilitating a simple, seamless, and secure booking experience for travelers. Why it’s important: Those who’ve had the chance to attend one of our webinars will be familiar with the following statistic: One traveler out of two uses metasearch when searching for hotels to book online. A recent Phocuswright report revealed that 50% of US online hotel bookers completed a hotel booking on or through a metasearch site at least once in the past year. When we single out millennial travelers, a demographic that continues to increase its travel spending and influence on travel trends, the percentage of travelers who go through a metasearch site to book their hotels online is higher still at 63%. The takeaway: We’ve said it before, but it bears repeating: The direct booking journey has moved to metasearch. 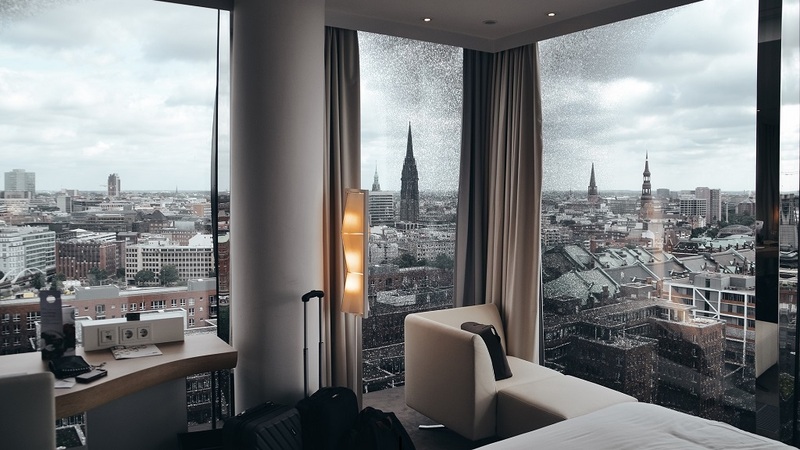 To stay competitive and tap into this direct business potential, hotels will need a booking engine that’s integrated with top hotel metasearch sites so that they can advertise their direct rates on these high-potential channels. 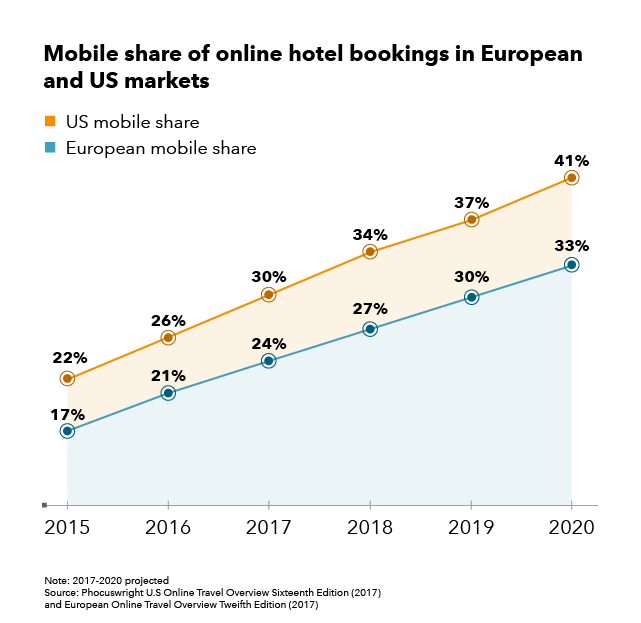 Why it’s important: Mobile hotel bookings are on the rise. Another report put forth by Phocuswright highlights the steady global shift of travelers using mobile devices to book accommodation. The takeaway: Any hotel booking engine worth its salt will be optimized to turn mobile traffic into direct bookings. This means the content on the booking engine displays correctly and functions smoothly on every device. Why it’s important: Brand awareness, mainly, but also conversion success and online reputation. Having the hotel’s images and descriptions on the booking engine sets accurate expectations for the traveler, laying the foundations of a positive experience for the guest and a positive online reputation for the hotel. It also helps create a seamless booking journey, something crucial to conversion success. And having the hotel’s logo visible throughout the entire booking stage means the guest knows exactly with whom they’re booking. This helps nurture the relationship between hotel and guest and foster a strong brand awareness for the hotel. The takeaway: If a hotel wants to fully own its guest experience and customer relationships (and enjoy the benefits of increased brand awareness), it needs to be able to customize its booking engine with its own logo, images, and descriptions. Anything less would compromise the hotel’s brand image and perhaps even its conversion rate and online reputation as well. A booking engine with all the above key features, as well as all the following added advantages, would be a huge asset to a hotel business. Such a booking engine would also be the all-in-one solution for any hotel looking to not only increase its direct bookings, but extend its market reach, simplify its day-to-day activities, and open new direct booking channels as well. To reach foreign travelers in international markets, a hotel’s booking engine needs to be able to support multiple languages and currencies. If it doesn’t, the hotel will have a challenging time increasing their market reach and converting travelers who speak different languages. A channel manager enables hoteliers to control their distribution, while a property management system simplifies and streamlines a hotel’s day-to-day operations, including processing reservations. Ideally, the hotel’s booking engine will be integrated with both pieces of crucial hotel technology. We recently published an article on how hotels can use social media to drive direct bookings. Taking that one step further, some booking engines enable the hotel to capture direct bookings on its Facebook Page. Considering how effective social media is in attracting qualified traffic, this feature is definitely a nice one to have in a hotel booking engine. Readers can find more ideas for increasing conversion in “4 Data-Informed Ideas for Higher Hotel Booking Conversion Rates,” more insights into crucial hotel technology in “The 10 Distribution Solutions Every Hotel Will Need to Compete in 2018,” and more marketing insights here on our blog. Looking for information on the hotel technology that a hotel can use to drive direct bookings? We can help with that, too. Click the button below to find out about trivago’s solution.